By SuperWife on February 13th, 2009 . Filed under: Artwork . Flour, frosting and fondant are the ingredients artist and baker Zilly Rosen will use to create portraits of US presidents Abraham Lincoln and Barack Obama, dpa reported. Washington’s National Portrait Gallery and the Smithsonian American Art Museum are co-hosting their fourth annual Presidential Family Fun Day on Saturday. The centrepiece of the event will be Rosen’s portraits, using 5,000 cupcakes arranged to look from above like Lincoln (1861-65), remembered as the Great Emancipator, and Obama, who took office last month as the first African-American president. “This presidential portrait is not only distinguished but delicious,” the National Portrait Gallery touted. Unlike the paintings in the galleries of the two museums, the cupcake portraits will have a very short shelf life. After staying on display for the afternoon, the artwork will be deconstructed by the children in attendance. The free, family-oriented event, an observance ahead of Monday’s Presidents’ Day, will also include fife-and-drum music, singing, storytelling and historical impersonators including Lincoln and other presidents. Thursday was the 200th birthday of Lincoln, who ordered the emancipation of slaves in 1863 and was assassinated in April 1865, just days after achieving victory in the American Civil War. The cupcake artwork will be titled A New Birth of Freedom, borrowing a phrase from one of Lincoln’s most famous speeches. 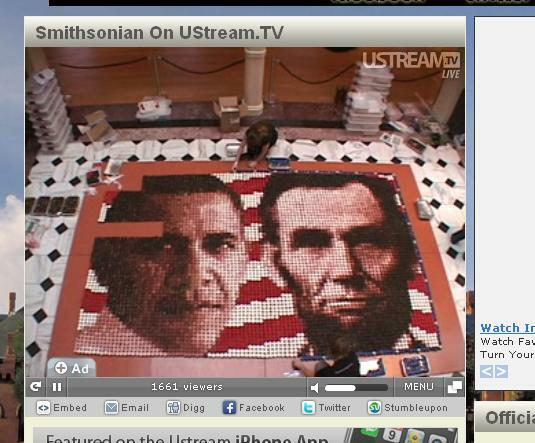 This installation was also streamed live via webcast! I thought that I should let u know that I really like your website & also that iloveu.<33. Whats up, I want to say thanks for an captivating website about a subject I have had an interest in for a while now. I have been looking in and reading through the comments avidly so just wanted to express my thanks for providing me with some very good reading material. I look forward to more, and taking a more active part in the chats here, whilst picking up some education too!! Halloween is no doubt one of my daughter’s most loved times of the year to go trick or treating together with their buddies and afterward they all round up at somebody’s apartment to snack on and share their different goodies.